There is a growing consensus of opinion that greater efforts are needed to usher in more foreign institutional investors to revive sentiment in China's A-share market, one of 2018's worst performers across global markets. In a fresh attempt to open the door to the mainland equity market, the State Administration of Foreign Exchange (SAFE), the foreign exchange regulator, announced on Monday that it would double the quota for the Qualified Foreign Institutional Investor (QFII) program to $300 billion. However, other than measures to enable easier market access for foreign investors, there is a vital missing piece in the country's efforts to appeal to foreign investors, namely, the lack of a sound derivatives market. It is high time the country put in place a well-functioning financial market for derivatives. In fact, the existing $150 billion quota under the QFII scheme, one of the earliest policy changes to facilitate the country's capital market opening, has yet to be used up. This indicates foreign investors' hesitancy about investing in the mainland's equity market. As of the end of December 2018, overseas investors received quotas worth $101.06 billion, slightly higher than $100.56 billion at the end of November, per SAFE data. Without suitable and sufficient derivative instruments, foreign investors tend to be hesitant about investing massively in mainland stocks, Raymond Deng, investment strategist CIO of consumer investment and insurance products at DBS Bank, told reporters in Beijing last week. Asian stocks, especially Hong Kong's H shares with a low price-to-earnings (P/E) ratio at 8.1 times, are more attractive to investors than US stocks that now record a P/E ratio of 17-18 times earnings, according to Deng. 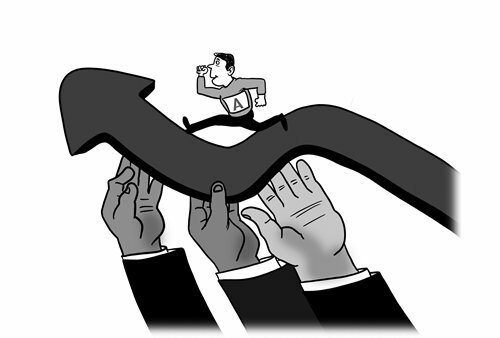 The P/E ratios of the mainland market are also at low levels, and both the country's political stability and multi-faceted opportunities resulting from its economic reforms are seen as underpinning mainland stock market growth. However, foreign investors might still find the H-share market more appealing as Hong Kong has a liquid derivatives market. Historically profit is made in the mainland's equity markets by trading from a "long only" perspective, yet with minimal opportunities to hedge the exposure. This means that investors wait until stock prices are very low and/or P/E ratios at very low levels, before taking on any long positions. In comparison, derivatives such as warrants and stock options are readily available for hedging and risk management in the Hong Kong market. Therefore it is more likely that overseas investors would be attracted to Hong Kong stocks in times of low P/E ratios, with the ability to hedge their exposure. There are now early indications that the regulatory authorities are now looking at this issue. At a forum on China's capital markets over the weekend, Fang Xinghai, vice chairman of the China Securities Regulatory Commission (CSRC), said that reasonable pricing is the key to maintaining capital market resilience, which can be provided with both the long and short traders supplied with suitable tools to determine share prices. Currently there is a lack of such tools, said Fang, revealing that the CSRC is working to introduce tools that both sides of the fence can use. He also suggested removing the 44 percent limit on the gain of an A-share stock on its trading debut, a rule introduced to limit speculation in 2015. Such restrictions could result in unreasonable pricing, as demonstrated by thin trading volumes in the first few trading days. Moves in this direction could also include a shift toward the T+0 settlement system which allows investors to buy and sell stocks on the same day and is widely used in the global markets. The current T+1 settlement cycle requires securities to be settled one day after trade date, thus inhibiting liquidity and trading efficiency in the volatile mainland market. It is certain that the introduction of wide-ranging derivative instruments will inevitably make the game harder for retail investors, the mainstay of A-share investors. The country currently boasts more than 140 million investment accounts, with about 20-30 million daily active traders, according to CSRC's Fang. It is interesting to note that investors in the A Share market are over 80:20 retail to institutional investors, where as in other major stock markets around the world the ratio is approximately 80:20 institutional to retail investors. Also, there have long been concerns in the market that short selling must have caused, or even been responsible for market declines. As a consequence, the authorities appear to have moved too cautiously in developing the country's derivatives market. However, this fear is based upon a very poor understanding of the role of derivatives in hedging and risk management. If the current concerns about derivative trading continue, the A-share market will only end up putting itself at a greater distance from its global counterparts. That is likely to work against the intention of making mainland stocks more globally competitive. The availability of more risk hedging tools is a must, and this will lay the groundwork for foreign institutional investors to consider taking giant steps into the mainland equity market. In light of the situation in the market, that will also mean giving broad-based efforts to educate the many retail investors who have until now only had a long side approach to stock investment.